connected. 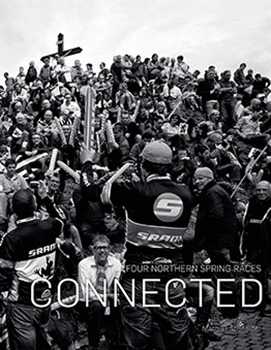 four northern spring races. mathias schneider. wanderer books 213pp illus. "We were a part of the whole ceremony." mrs washingmachinepost is over in scotland visiting our daughter and two grandsons, the youngest of which was born a mere two weeks ago. that leaves me as an orphan for the week and all the malnutrition that such entails. however, it does mean that, following the sunday ride and my superb attempt at creating a mushroom omelette with a side order of fried potato scones, i am blessed with a modicum of free time in which i might do whatsoever i please. for christmas last year i was presented with a crosley portable record player; decidely lo-fi, but no worse i suspect, than the audio available when my sole choice of vinyl was first released in 1956, some sixty years past. indicatively entitled 'the jazz messengers', it features band leadership by one of my percussive heroes, art blakey, accompanied here by horace silver, hank mobley, donald byrd and doug watkins. with vinyl experiencing something of a resurgence these days, this particular edifice is manufactured on 180g plastic, a tad heftier than those i used to purchase just as the cassette tape started to slowly pull the rug from under a blissfully unaware rack of album sleeves. though the music contained hardly fits the description of background music, on this particular sunday afternoon, it fulfilled the role of highly apt accompaniment to mathias schneider's photo essay 'connected', a heavy, large(ish) format book of the man's photography, lavishly printed on appropriately heavyweight paper. 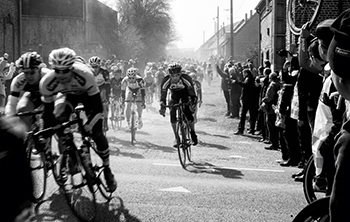 its subject matter is evidenced by the book's subtitle 'four northern spring races': the ronde van vlaanderen, paris-roubaix, fleche wallone and liege-bastogne-liege. "All four have an eventful history, they each show how deeply they are anchored in their region and all of them allow the spectators to celebrate their typical enthusiasm at the race course." at a pinch, i can see the tenuous connection between rock music and the likes of formula one motor racing, but if no-one has previously made a connection between fifties hard bop jazz and the spring classics, then i stake my claim here. this is one of those books to die for. mathias is a particularly accomplished photographer with an eye for the sort of thing that would almost certainly pass by you or i. his predominantly monochrome images (135 b/w and 16 colour) are totally free from artifice or pretension, focusing as they do on the factors that surround the four connected races. 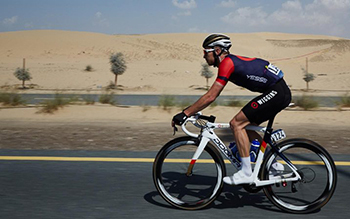 "The peloton's run always lasts only second, probably minutes, and then it's all over. Afterwards, on our way home, we would compare notes. No question, the fight at the crux of the hill anad the passage of the riders was the great moment everyone was yearning for, but the dynamics and the drama of the race wouldn't have worked if we hadn't been waiting there. 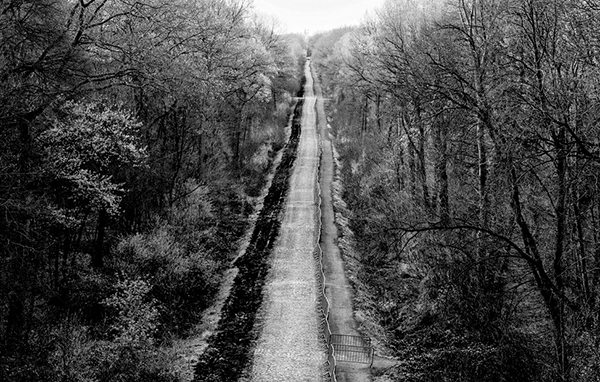 The whole day becomes the experience, including the long wait at the track." should my review so far give the impression that this substantial body of work is devoid of any racing cyclists, nothing could be further from the truth. 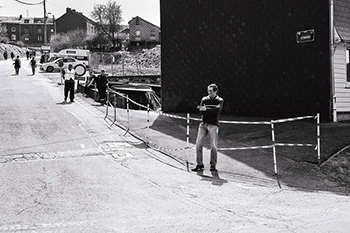 mathias schneider is every bit as adept at pressing the shutter at the right moment when faced with a rushing or snaking peloton as he is capturing the still life of an abandoned brick building adjacent to some particularly lethal looking cobbles on the way to roubaix. and if you thought your roads were in need of a tad more than surface dressing, his close-ups of some of those stretches of cobbles would bring tears to your thighs. connected is a work of passion. nobody gets this close, this specific without feeling the same about the northern classics as do we. 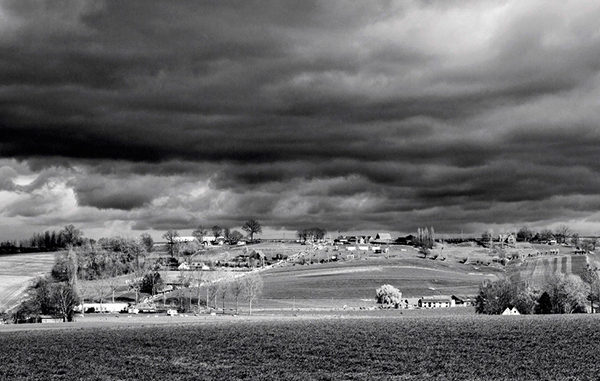 there's a touch of cartier-bresson here and there and i can truthfully think of no higher praise. 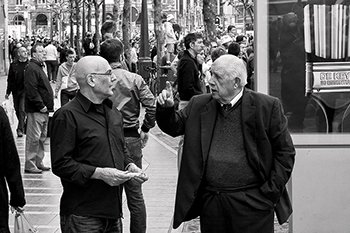 witness the double page spread opening the la doyenne section with the street sign stockeu isolated in a wall of heavy, deep black shadow. 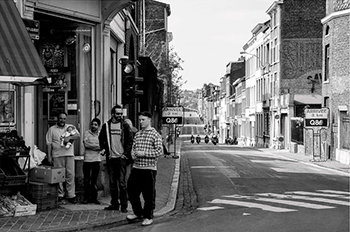 or the cigarette smoking gent leaning at a stone-walled street corner awaiting the arrival of the fleche peloton. or bizarrely, a dining table, complete with white tablecloth and chairs set up at the opening to a silage pit, still half full of silage. according to the colophon on the book's final page, the print run for connected was limited to 500, and there seems every likelihood that some of those have already found good homes. which means, of course, that there might now be something of a scrabble to acquire a copy of your very own. the cost is €45 (about £35) and there really isn't a single defensible excuse you can come up with not to place an immediate order. i have said before that i think it likely that cycling benefits above all other sports, from a wealth of superb photographers, documenting every aspect of our favoured sport. mathias schneider has emphatically declared his membership credentials. and despite my contention that connected goes with jazz like peanut butter does with jelly, the book features text by maxime schmitt, co-author of kraftwerk's tour de france album. as far as the weekly perambulations are concerned, it's still very much a case of bibtights or shorts and legwarmers, matched up top by a long-sleeve jersey, likely a gilet but more often than not, a jacket. and though i have many an attractive casquette from which to choose, it'll be well into april, if not may, before the decision is made to dispense with a winter cap and allow my ears to go al fresco. though there is little doubt that the temperatures have relented somewhat since the sub-zero rides of yore, that omnipresent wind continues to lower the mercury just enough to countermand the notion that spring may actually have sprung. 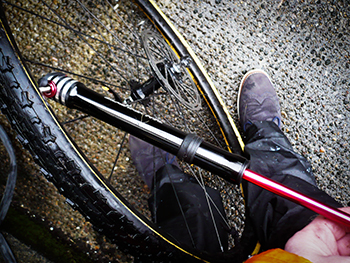 and the comfort factor of a waterproof jacket, that winter hat and more often than not, a pair of overshoes may not actually fend off the rain, but psychologically goes someway to ameliorate its often depressing effect. yet we are on the fringes of the spring classics; already kbk, het nieuwsblad and those gritty roads in tuscany have been fought and won. paris-nice now draws to a close, having had one stage abandoned due to ferociously cold weather, and sanremo, flanders and roubaix are just around the metaphorical corner. i like to promulgate my fictitious flandrian heritage, but there's darned little chance of divesting garments in order to prove it. yet eurosport and sporza will testify to the fact that the bulk of the springtime peloton races without legwarmers and more often than not, in short sleeves. how and why do they do that? it has crossed my mind that perhaps the chaps in the following cars have foisted a three-line whip upon those hapless professionals, quoting paragraph 37, subsection 4 of their team contract that distinctly states, under the heading uniform, that forearms and knees must be seen when traversing the cobbles. for surely, in the face of a belgian spring, which can't be all that different from mine, nobody in their right mind leaves the leg and armwarmers either at home, or in the boot of the team car. perhaps i misjudge them and there is a secret stash of both items of apparel secreted in the glove compartment of a mavic car. one need only feign a puncture or alternative malady to allow clandestine flouting of team regulations. though i have mentioned a long-sleeve jersey in my diatribe above, on occasion i have opted for a short-sleeve alternative matched with a pair of armwarmers. the thinking behind this is optimistic; perhaps my exhaustive efforts in the saddle will have me perspiring in the face of adversity, in which case, it will be a simple matter of removing said armwarmers and drifting back to the team skoda to pass through the driver's window in return for a sticky bottle. i may not have the athletic prowess of thomas or bouhani, but i do possess a vivid imagination. yet, despite my meteorological misgivings, it would be a thorough pessimist who opted to purchase a long-sleeve jersey at this juncture in time. 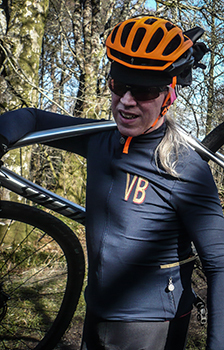 it may be possible to garner a few weeks wear from its presence in the cycling wardrobe, but ultimately, it is likely to prove a tad incongruous when the sun comes out. and lets face it, a matching pair of armwarmers may conceivably upset the bank manager just a smidgeon more than one would prefer. what's a honed athlete to do? 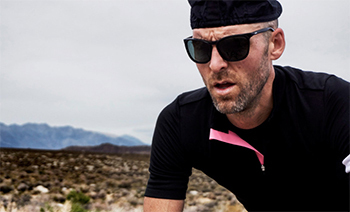 well, i'm glad you asked that, for the stalwart chaps and chapesses in tileyard road's imperial works are currently offering a free pair of white armwarmers with the purchase of any short sleeve rapha jersey, including the core range. 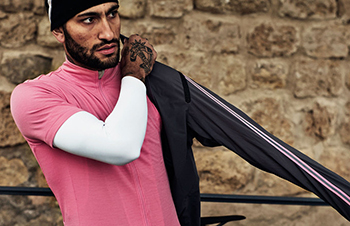 bizzarely enough, as i peruse the impressive collection of jersys on rapha's website, it seems that even purchasers of a team sky long-sleeve brevet jersey will be handed a pair of armwarmers. that is generosity indeed. i've no idea for how long this offer remains current, so it may be prudent to order sooner rather than later. as if cyclists don't have enough problems. consider the ignominy of riding out each and every sunday with grubby bar tape; the embarrassment of scuff marks on the cranks; the banishable offence of having fitted your tyres with the label nowhere near the valve stem, or the major fashion faux pas of showing skin between armwarmers and jersey sleeves. and those are only the travesties i can think of, off the top of my head. no wonder it's considered the toughest sport in the world. but all of the above pales into insignificance when faced with the conundrum of inflating your tyres with either a direct-fit pump or one of those devices with a screw-on hose. i relinquished using the former a good number of years ago after snapping off that tiny valve head in a fit of deflated exasperation. the reliability and (literally) flexibility of a screw-on hose seemed the ideal solution to the potential and actual problems realised by the direct-fit method. that was until a couple of sundays ago. only a few metres past kilchoman distillery and for the second time that weekend, my rear tyre suffered sudden deflation while still more than a handful of kilometres from coffee. no problem, thought i; a simple matter of removing the wheel, unhitching one side of the tyre and replacing the defunct inner-tube. and that was precisely how subsequent events played out, until it came time to inflate the new tube. after screwing on the hose, i attached it to the pump and proceeded with my finest scwarnold arzenegger impression to speed matters along just nicely. having achieved a pressure that i was confident would get me to debbie's (we keep have a track pump there for just such situations), i unscrewed the hose, only for the replaceable valve core to remove itself simultaneously. explosive decompression. though i now realise it is possible to purchase spare valve cores, i cannot recall a situation in which that has been the cause of my puncture. and before anyone says, the two occasions on which i snapped off the ends of the valves were on those without replaceable cores. to be honest, the cost of even a quality inner tube these days is less than onerous; i still find it simpler to replace an inner tube than attempt to repair it. i agree that the simple solution would be to only purchase inner tubes featuring single-piece valves, but in the current case, i had only just placed an order for a whole skoosh of new tubes the day before what we now refer to as the 'kilchoman distillery incident'. and they (continental) are all fitted with replaceable valve cores. perhaps it was time to revisit the direct-fit pump; surely things had moved on since i managed to break stuff? this new inflationary horizon took the shape of an axiom blastair hvl alloy mini-pump on which the initials hvl, i am assuming are an abbreviation for high volume. the current bike type with which i find myself besotted, is that of the cyclocross genre. i've been riding 33mm tyres since the end of november last year and have every intention of continuing the trend into the foreseeable future. as a part of the review procedure and also to rid myself of puncture potential, i removed an apparently offending duo of rubber and replaced it with that of far higher quality, bringing front and rear tyres up to pressure by means of the axiom blastair. if i had been paying attention to the process, i'd have counted the number of strokes required to inflate both to around 40psi. but i didn't. however, despite the axiom being a small (a mere 25cm) pump, its inflationary abilities were most impressive. 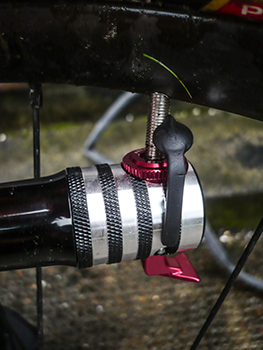 the concealed chuck is reversible for use on both presta and schrader valves, while a recessed pink anodised lever can be flipped up to lock the pump onto the valve. when the inflation process is complete, the handle can be parked on a rubber gasket attached to the outer shaft. it cannot be denied that the pump's length leaves about a third showing when stuffed in a jersey rear pocket, but that's hardly a situation worth crying over. for such a ultilitarian device (i would find it hard to work up feverish enthusiasm for a carbon fibre pump) the axiom has a rather pleasing black/silver art-deco look about it. surely the very item charles rennie mackintosh would have claimed for his own bicycle. the blastair arrives with an appropriate bracket to allow fitting of the pump alongside a downtube located bottle cage, should you prefer not to sully a rear pocket. it's rated to 120psi, something i've yet to attempt, but considering the ease with which it inflated a 'cross tube to 40psi, i wouldn't bet against managing 80psi more in a 25c road tube. and all this for a mere £30. 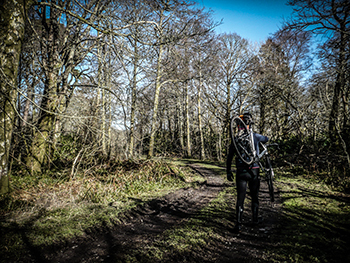 axiom products are distributed in the uk by paligap and available via your local dealer. i need to be really careful here, because this is the sort of situation i've dropped myself in before and had then to eat a large slice of humble pie. i did this with ceramic bearings, reputedly of very low friction, but about which i had my suspicions, or at least suspicions that i'd probably never notice the difference. two derailleur jockey wheels later, i looked very silly, because there was a distinctly noticeable difference within a few metres of riding. and having not learned from the first situation, i proceeded to make the same mistake in relation to a ceramic bottom bracket and similar bearings fitted to a pair of chris king r45 hubs. the standard versions were perfectly adequate for my mundane road-going efforts, but heck, those ceramic bearings are still gliding even three or more years later, proving, if proof were required, that i am a total numpty when it comes to discussing that of which i have little experience. though i have the experience now. this has led me to be a tad more circumspect about the latest technological developments, whether or not they are likely to make much, if any difference to my weekly cycling regime. 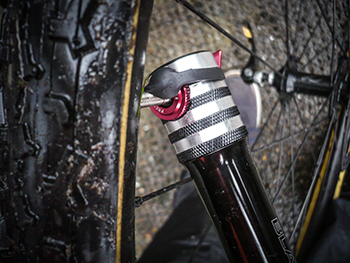 something such as muc-off's nano tube speed film. though you may think you've never heard of this before, in point of fact, you more than likely have, though it might not have mentioned nano tubes first time round. 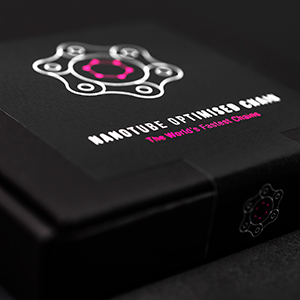 for bradley's 54.526km hour record last year, muc-off grabbed themselves a pile of shimano chains, popped them on their chain lube optimisation dynamometer, or c.l.o.d. for short and checked which of the batch exhibited the least amount of natural friction. the successful applicant was then cleaned within an inch of its rivets, before being doused in nano tubes to make it the least frictional chain in the entire universe. the fact that brad achieved his hour record, more or less proves that they weren't wasting their time. cycling is often cited as an excellent example of a sport whereby those with the necessary bank balance can kit themselves out in identical fashion to their heroes. such an assertion assuredly needs to be all-encompassing, even down to something as formerly insignificant as a bicycle chain. the altruistic folks at muc-off are apparently well aware of this situation and are now offering bradley's chain to the great unwashed. 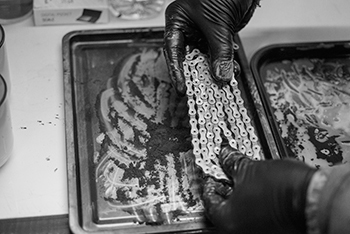 well, actually it's not that specific hour record chain, but a range of ordinary bicycle chains coated in millions of little nano tubes compatible with shimano, sram and campagnolo drive trains. 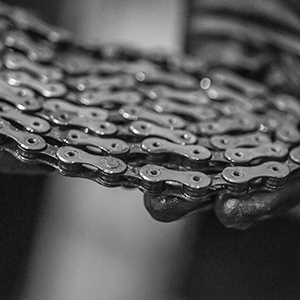 if you recall that bradley's chain was created at the rather eye-watering price of £6,000, assuming you're sitting down at the moment, i might point out that the price of your very own nano tubes will relieve you of £135 for shimano, £137 for sram and a whopping £140 for campagnolo. whether you reckon that's a price worth paying to save up to six watts is between you and your independent financial adviser. those of you at the back have, i seem to note, realised that after an indeterminate distance (well, somewhere around the 250 kilometre mark, actually), the lube will likely have lost a few of its nano tubes. muc-off have already thought of this in advance, generously allowing you to purchase a £35 top up bottle of nano tube speed film. 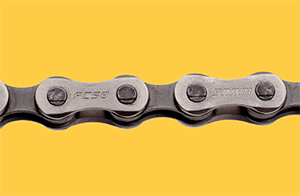 potentially, the much-reduced friction co-efficient of any of these chains would allow them to last marginally longer than the bog standard models you can buy from chain reaction. but since this is something of an indeterminate and unknown quantity, it would make prudent sense to start saving for the successor while riding the first one. muc-off admit that the top-up won't restore the chain to its frighteningly expensive original state. "It won't be as fast as when it was first treated, as we use a special technique and processes to ensure the formula is driven deep into each link for 100% coverage (we also apply a powder externally) but you can still achieve significant savings. Don't worry it will still be one of the fastest chains on the planet!" life's come a long way since the days of a tin of 'three-in-one' oil on the shelf just under the shed window. in my dotage, i've taken to watching jonathan creek re-runs on a freesat channel operating under the name of the drama channel. these episodes appear to be scheduled to commence at 10pm and though originally made as a one hour programme by the bbc, with advertisements, the broadcasts usually end around 23:15. i know exactly what you're thinking: isn't that well past slumbertime for a honed athlete? and i do believe you'd be correct. mrs washingmachinepost has already retired by this time as she has need of arising around an hour and a half prior to my dragging myself from the cosy comfort of a multi-tog duvet. it is this large exapnse of fluffiness that is so welcoming of an evening (when jonathan creek has ended) yet highly reluctant to let go when radio four's sports report impinges on the clock radio at 7:30am each weekday morning. graeme obree contends that man's two finest inventions, in no particular order, are the duvet (as already mentioned) and the bicycle. though i have extensively mentally researched this statement by the flying scotsman, i truthfully cannot refute his logic. 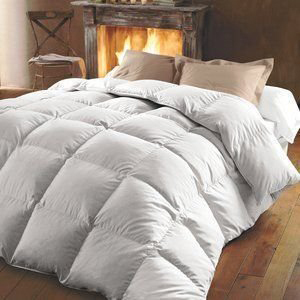 my experience of the duvet is probably every bit the same as the majority living in the northern hemisphere, particularly when mrs washingmachinepost insists on having the window opening during sleepy times. the bicycle i have considerable experience of, having ridden one 365 days per year delivering daily newspapers from the age of twelve till seventeen when i left for college. aside from those artistic years in the wilderness (so to speak), i have ridden a bicycle since the age of 24, a fact that i would respectfully tender as my curriculum vitae for the job. the double-diamond frame, whether constructed from steel, aluminium or carbon fibre, i totally get. having received more than just a few decades of development since its late 19th century introduction to mankind. effectively the bicycle has all but completed its evolution. 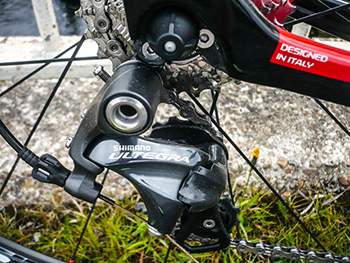 side stalls such as electronica and disc brakes are mere icing on the cake and strictly speaking, don't count. however, no matter my years of acquaintance with the velocipede, i still find it bordering on necromancy that the rear derailleur manages to almost imperceptibly slide the chain up and down an ever-increasing number of toothed sprockets, when common sense dictates that to be all but impossible. leaving aside the fact that someone actually thought of this mechanical process in the first place, shifting a moving chain sideways from a small sprocket to a larger one and having the gaps between links match up with the teeth strikes me as the sort of thing the uninitiated would regard as fiction, were it not so easily demonstrated on any road, 'cross or mountain bike. and as if that were insufficient to demonstrate the veracity of mr obree's statement, consider the fact that the parallelogram constituting what we now refer to as the rear mech or derailleur, often achieves this mechanical miracle at speed. 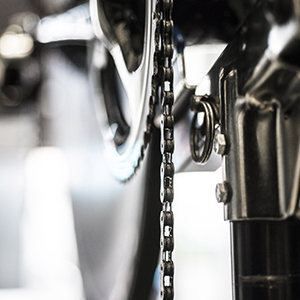 yet, not only does it manoeuvre a series of metal links up and down a shiny cassette, but simultaneously manages to maintain an expected chain tension throughout the whole process. the front mech is, admittedly, less impressive in its tribulations, but darned clever nonetheless. the scary part of all this is that we pretty much take it all for granted. while a set of springs and metal or carbon plates cater to our every gearshifting whim, almost in glorious silence these days, we are content to sit on our saddles, hands on the levers, discussing the minutiae and iniquities of contemporary society. mind you, the last time i flew to america, i can't say i was perpetually mindful of the intricacies of the gas turbine jet engine. i don't think graeme ever mentioned that. as a world famous cycling journalist, it behoves me well to effect a velocipedinal personality displaying few, if any, chinks in that armour. no matter where i might find myself and whatever specific situation, the ability to turn on a brake shoe washer in tune with the circumstances is a superpower that has been carefully honed over the years. thus, should anyone bring to my attention a hitherto unknown component, item of apparel or frame design, i feel it incumbent on my status to either discuss intrinsic aspects of same in great detail, or at least bluff my way through with scarcely the blink of an eye. disappointingly, that constitutes the fiction. there are so many continual developments in the world of the bicycle, that one would need to be carlton reid to keep tabs on all the comings and goings. 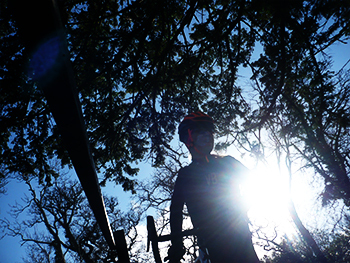 for it may come as something of a surprise that, though we frequently describe the sunday ride as a conversational ride, rarely do those conversations revolve around matters of velocipedinal importance. granted, should there have been a cycle race taking place over the previous few days, there is every likelihood that the result and events leading up to that particular finish-line will be at least briefly discussed. however, unless the constitution of the sunday peloton results in an odd number, there is a greater than evens chance that at some point in the kilometres, i will end up next to the member of the velo club who delights in discussing not only the number of spokes adjudged appropriate for a rider of his build, but the precise nature of their particular butting. and whether rims ought better to be eyeletted, double eyeletted, or not eyeletted at all. in keeping with the geekiness often cultivated by the cycling obsessive (been there, done that), as a general rule, it's only exotica that posits itself as appropriate subject matter. or preferably items of which we not only know naff all about, but have no experience whatsoever as to their true function. 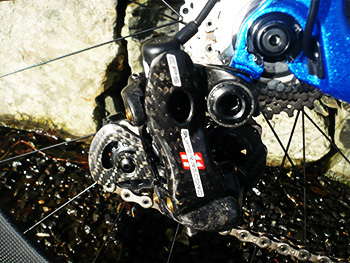 most recently, these conversations have concerned disc rotors and whether they might have an inbuilt incompatibility (and let's face it, that wouldn't be the first time such an occurrence has been brought to light in the bicycle industry) due to varying thicknesses that might preculde matching certain discs with certain calipers. is it not bad enough that there are more than just a few diameters available? i can say without fear of contradiction, that not one of us has the faintest notion of how to bleed a set of hydraulic disc brakes, nor exactly what dot 5.1 fluid actually is. nor, indeed, do we have any particular knowledge regarding the functionality of electronic gear shifting. granted, we all know how it works, but no-one's admitting to knowing what to do next when it turns out to be not working. it's probably better that way. sadly, the necessities of life never quite make it to the conversational surface. were this over a decade past, the question would remain mute; eight and nine-speed chains had allegedly greater built-in tolerance for such inclement conditions. 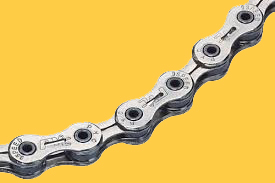 eleven speed chains, however, are by their very nature, a tad more anorexic and subject to greater a degree of precision, a state of affairs i'd figure makes them more prone to undue wear. but this is one of those matters of great concern that remains unspoken, so in the absence of any seriously misinformed advice, i'm going to go ahead and order a new chain. then i'll talk about it on sunday. argument simmers as to the correct definition of the word acronym. though one side of the discussion insists the correct meaning to be an abbreviation formed from a series of initial letters (such as n.a.s.a. ), the opposite side of the coin is more given to seeing it as an abbreviation pronounced as a word. either way, it is a feature of contemporary society that they form an ever-increasing portion of our daily lives. an advertisement recently appeared in islay's local newspaper, alerting readers to the fact that the ijcvs were holding their agm at icci. i'll refrain from blighting your day further by explaining just what that all entails, but i figure you can see where i'm coming from. 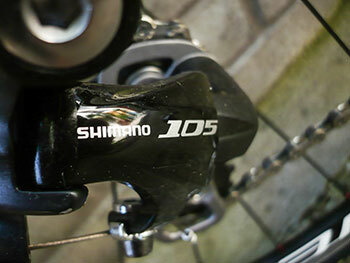 several of our most favoured cycle providers are every bit as guilty; witness pinarello's f.a.s.t. range of components, or mavic's u.s.t., s.c.c. and a.r.c.. meaningless in and of themselves, but verging on the technically impressive if you have no idea of that to which they refer. and now i possess a long-sleeve winter jersey with the letters vb beautifully embroidered front left. i have decided that they are a contraction of victorious brian. every bit as vacuous as most other acronyms, but handy to have as a ready answer when anyone enquires as to their representation. and believe me, they have. though personally the self-praise holds greater sway, in point of fact, the letters v and b refer to the jersey's originator: velobici. this is an inescapable alternative, proudly embroidered across the back between my shoulder blades on their latest long-sleeve continental jersey. it is, it has to be (readily) admitted, a thing of beauty and, for those not in possession, one of potential envy. i need not reiterate my self-declared love of the long-sleeve jersey in all its manifestations, but i do rather adore the fact that the continental features thumb loops at the cuffs of its extended length sleeves. popping right and left thumbs in place prevents those insidious, wayward draughts from reducing the cosy warmth engendered by the fabric and a well-judged height of collar. additionally, on the few occasions i've come across thumb loops such as these, after a few dozen kilometres, they hurt my thumbs. not so in this case. the acronymically named vr1 material from which the continental is hewn offers hitherto unrealised comfort, allied to an impressive four-way-stretch and a clever thermal loop inside to maximise its fluffiness properties. 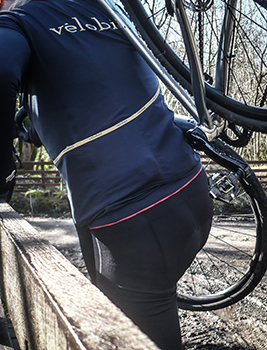 in keeping with many modern-day jerseys, there is silicon gloop on the dropped rear hem to "keep everything where it should be, regardless of the conditions" to quote from the velobici website. a few centimetres above this hem is an idiosyncratic, yet intelligently thought out pocket arrangement: three differently sized open pockets, coupled with two zipped variants, one each side of the jersey. you just know this jersey has been designed by a kindred spirit; that leftmost zipped pocket is ideally placed to contain coffee money. the smallest of the open pockets is sited adjacent to the coffee money pocket and pretty much on the side panel of the jersey. here is the ideal spot for that mini-pump, preventing the darned little blighter digging into your spine, seated on one of debbie's chairs while supping the froth that the aforementioned money afforded after a sunday ride. the remaining two pockets offer what can realistically be deigned, substantial cargo space. all three zips can be opened and closed without need for gloved fumbling, due to medallion style vb chainring zip pullers. prior to dwelling on other aspects of what is truly a superlative jersey, it seems pertinent to make mention of the fashion in which the pocket array is styled. leading from the left, the pockets increase in depth by means of a parabolic curve up towards the rear right. 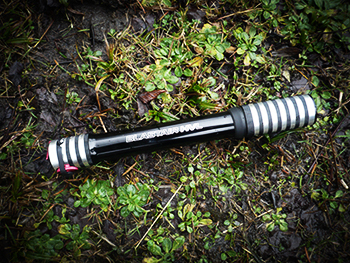 after all, a mini-pump probably requires less pocket depth than does a scrunched waterproof cape. aside from the velobici logo'd reinforced top to these pockets, this demonstration of thinking outside the monocoque deserves more than just modest adulation. 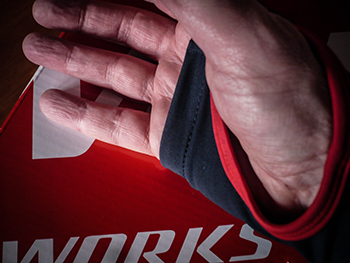 the stretchy fabric serves to flatter, holding close to that honed athletic figure whether on or off the bicycle. though the majority of my forays into the wild west were rarely accompanied by temperatures that encouraged ventilation, the front zip tag is easily graspable, even with thermally insulated fingers. though i cannot deny i had need of wearing a gilet more often than not, the closely knit vr-1 material kept the wind at bay while wicking the scarce amount of perspiration engendered by one or two rides in sub-zero windchill. 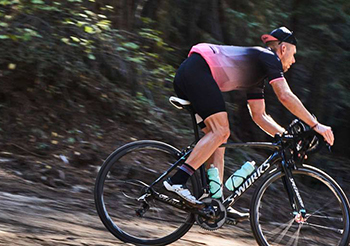 velobici's continental jersey very effectively eschews any notable association with the peloton, harbouring a desirable style all of its very own, yet sees fit to display the acronym for victorious brian on the left breast. and it's made in nottingham. the mighty dave t will like that. velobici's long-sleeve continental jersey is available in navy blue only, in sizes from xs to xxl (medium reviewed) and retails at £160.